For the second consecutive season, the Racing Spectator Driver of the Year Presented by RacingTrader.ca trophy is heading back to Prince Edward Island. The fans have spoken and they have chosen Oyster Bed Speedway Four Cylinder Champion James Doucette as their Driver of the Year. Over 1,300 votes were cast in the final ballot voting over the two week period with Doucette taking 37% of the final vote. Doucette hopped out to a lead early in the voting, an advantage he would never relinquish. Maritime League of Legends Tour and Scotia Speedworld driver Emily Meehan had a strong second week in the campaign and vaulted to fourth to second in the final days of the voting. Meehan scored 19% of the vote and finished 35 votes ahead of Scotia Speedworld Dartmouth Dodge Sportsman Series driver Harry Ross White. HOSS completed the fan voted award just 19 votes ahead of Petty International Raceway Bandolero champion Cole Tanner. Tanner edged out Speedway 660 Bandolero champion Cole Boudreau on the final day of first ballot voting to get a spot on the final ballot. Joe Hoyt, who completed the Atlantic Open Wheel Tour on a hot streak, came home in fifth with 12% of the vote. 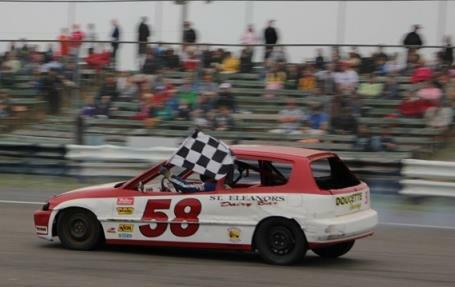 Doucette picked up 15 checkered flags on the season at Oyster Bed Speedway aboard his #58 Gentleman Jim’s Restaurant and Lounge Honda Civic, with five of those being feature wins. Accompanying his wins came five second place and nine third place finishes. With those finishes have brought points. Doucette won not only the divisional championship in the Honda Outlaw class, but also took home the Super Series title, a mini-series within the championship season. Doucette’s effort is also sponsored by Canadian Tire Summerside, Dinos Pizza Summerside, Gentleman Jims, St. Eleanors Dairy Bar, T+K Home Improvements and John DesRoches Contruction. Doucette’s pit crew is made up of Eldon Doucette (father), Katy Bernard (fiance), Joe Doucette (uncle) and Courtney Doucette (sister). This is the third time a Prince Edward Island driver has won the award. Doucette joins now Parts for Trucks Pro Stock Tour drivers Darren Mackinnon (2011) and Jonathan Hicken (2005) as Island winners. This is also the first time a Four Cylinder class driver has won the award. 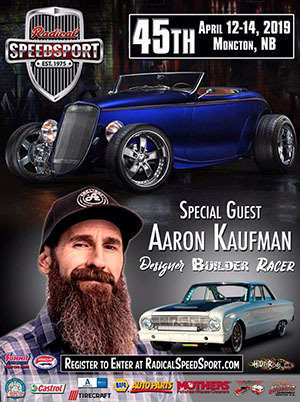 Doucette will receive the trophy at the annual Oyster Bed Speedway Awards Banquet on Saturday, November 10th at the APM Centre in Cornwall, PE. The Racing Spectator Driver of the Year Award Presented by RacingTrader.ca is a fan nominated and fan voted award founded by Bruce and Bea Langille in 2003. When the Racing Spectator and RacingSpectator.ca changed hands in 2012, the award came to TimsCorner.ca and Tim’s Corner Motorsports. Nominations for the award were taken throughout the month of September with the voting taking place in the month of October. Tim’s Corner began as a weekly stock car racing column appearing on ScotiaSpeedworld.ca and MaritimeProStockTour.com, penned by track and series announcer Tim Terry. It has now grown to include basic media services for motorsport teams big and small. TimsCorner.ca, the official website of Tim’s Corner, also features Tim’s Corner Unplugged, a podcast hosted by Terry which focuses on the motorsports scene. For more information on Tim’s Corner and services offered, visit TimsCorner.ca!